Las Vegas has been officially confirmed as the host city for the Longines FEI World Cup Jumping and Reem Acra FEI World Cup Dressage Finals in 2015. Las Vegas has already hosted the FEI World Cup Finals five times – in 2000 and 2003 when it staged the jumping finals, and in 2005, 2007 and 2009, when the jumping and dressage finals were combined. 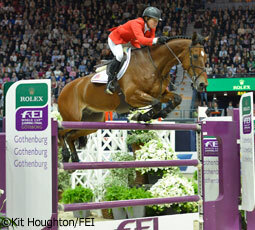 The FEI World Cup Jumping Finals were first held in Gothenburg (SWE) in 1979. Seven years later, the first FEI World Cup™ Dressage Finals were held in ‘s-Hertogenbosch (NED) in 1986. Las Vegas was the first venue to host combined FEI World Cup Finals when jumping and dressage were staged together at the Thomas & Mack Arena University of Nevada, Las Vegas in 2005. Wonderful. Was at previous event in Vegas. Great to be back.